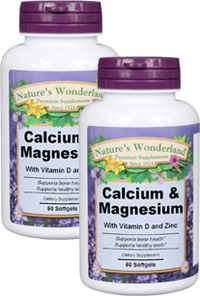 Calcium & Magnesium - 60 softgels each (Nature's Wonderland) - Penn Herb Co. Ltd.
Did you know stress, junk food, and common medications such as diuretics can rob your body of Calcium & Magnesium? Don't get short changed! Our balanced blend promotes strong bones as well as healthy nerve and muscle function. Vitamin D3…the "sunshine vitamin" works with Calcium to unlock its bone strengthening properties. Zinc…vital for the formation of collagen, the protein that keeps connective tissue healthy, and is necessary for calcium to form bone. Promotes strong bones and healthy teeth; maintains healthy nerve and muscle function; supports healthy enzymatic activity; promotes cardiovascular health; relieves stress. As a dietary supplement, take 3 softgels daily.